As we work towards our goal of every child in India receiving excellent education, our primary objective and priority is to ensure quality education for students from disadvantaged backgrounds who attend government schools. We implemented the ‘Supporting School Improvement through Improved Accountability to Community’ (SIAC) for the erstwhile State of Andhra Pradesh. The lack of accountability in government schools is largely responsible for poor learning outcomes. 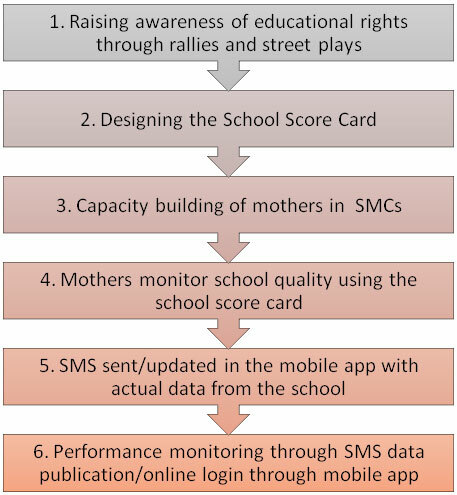 To empower illiterate parents to engage school leadership in meaningful dialogue, the simple tool of the pictorial School Score Card and a traffic light system of rating were made available to parents to assess schools on 24 Quality Parameters prescribed by the Sarva Shiksha Abhiyan (SSA). This programme was initially funded by the Department for International Development (DfID), United Kingdom and run in	87 schools across 60 villages in 6 mandals, Anantapur District, Andhra Pradesh. The success of the programme saw it being scaled up to implementation in 425 schools run by the SSA. CfBT Education Services was chosen from over 300 participants to be honoured as a Social Innovator in Education by the NASSCOM Social Innovation Forum 2016.